This 3600 - 4000 SF mountain view home has all the amenities of fine living. From the soaring ceiling, hand hewn logs, granite counters and alder woodwork, with hardwood and slate flooring throughout, this home will provide views 'to die for'. The master and guest bedrooms have queen beds, private bathrooms and HD TVs. The upstairs has two bedrooms (one with a queen bed, Discounts ($100 - $200) are available for bookings 6 days or longer and if you only want to use the 4 original bedrooms the rate is $50/nt. cheaper. Entertaining family and friends will be easy with a fully appointed gourmet kitchen, fireplaces in greatroom and Master bedroom, balconied loft w/ pool table,foosball, and a premier theater room with leather recliners for 12, featuring a 110' HD screen, Blue Ray DVD, and THX surround sound stereo system throughout. We have added a 6-7 person hot tub on the deck, and new larger HD TV's in the MB and guest BR. Hiking is all around! Ski at Wolf Creek (most recorded snowfall in CO), or trout fish across the street in the San Juan River! You will never need to leave this resort quality home. Our family consists of seven children. My closest brother and his family and ours have been meeting together in Pagosa Springs for over twelve years. We are now able to sometimes meet two times a year. We always look forward to this time together! Some of the most beautiful country in Colorado. Wonderful skiing without the big crowds or long lift lines. Dependable snowfall. Fantastic whitewater rafting and kayaking. Genuinely nice people. Thousands of acres of wilderness areas. Abundant wildlife. Great fishing. A slightly slower paced lifestyle. Peace - a focus on family and having fun together - the sheer beauty of the country from the decks almost demands introspection as well as stimulating a desire to hike to take in all of the natural beauty of this wonderful area. With our new addition, an option of the original 4 or now up to 6 bedrooms (for extra space). The extra space if desired, adds $50/nt. There are a lot of gravel roads - swithbacks up the mountain - great for walks. Mountains are in view from the deck, living room, master bedroom, upstairs and the other bedrooms. New 5-6 person tub just added on the deck. Loved the cabin and would recommend it. Will more than likely stay again in the future. We just got home from the most fun winter vacation! This house had everything right there at our fingertips. The location was perfect! We cooked out on the grill, watched movies in the theatre, sat in the hot tub while it snowed around us and even sled down the hill right outside of our front door. This house is perfect for a large group, never once were we crowed or in anyone's way. I could go on and on but you won't know how great it really is, until your actually there. Very nice home with all the amenities! We used it for a 12 person marriage retreat and it worked perfectly. Highly recommend this property . This wonderful, upscale log cabin provided a great vacation for our group this past week. Even at 10 occupants we were very comfortable in this very spacious home with all the full baths, big bedrooms and living spaces. The kitchen was well stocked with all the cooking tools and everything we needed for dining/service. The home theatre is state of the art - better than most paid cinema experiences and the hot tub was great to come home to after our great ski days at Wolf Creek. We'll definitely be back and we'll be recommending this perfect location that is the closest you'll find to the ski area. Thank you Jack for a great experience! Thank you so much for your kind comments. We are always so happy when families enjoy our home! We always look forward to nice families returning! Thanks again. Totally love this home. Spacious, beautiful and very cozy. My family had the best experience at this destination. Even though it was a couple of days It was a great experience for us all. We will for sure be going back to this home in the future. The owner is awesome and very welcoming i will recommend this home to anyone looking for a great get away in the mountains. Hotsprings(therapeutic), Sledding for the kids in the immediate area. Security codes and entrance methods will be given the week before your stay (phone call) as codes are changed periodically. In winter 4-wheel drive is not necessary except sometimes for entrance into the garages. Garage has now been eliminated for the time being. A front pullout area is available if necessary. Snow removal is done daily as required. Spa may require a tablespoon of shock at the end of daily use (close to spa). 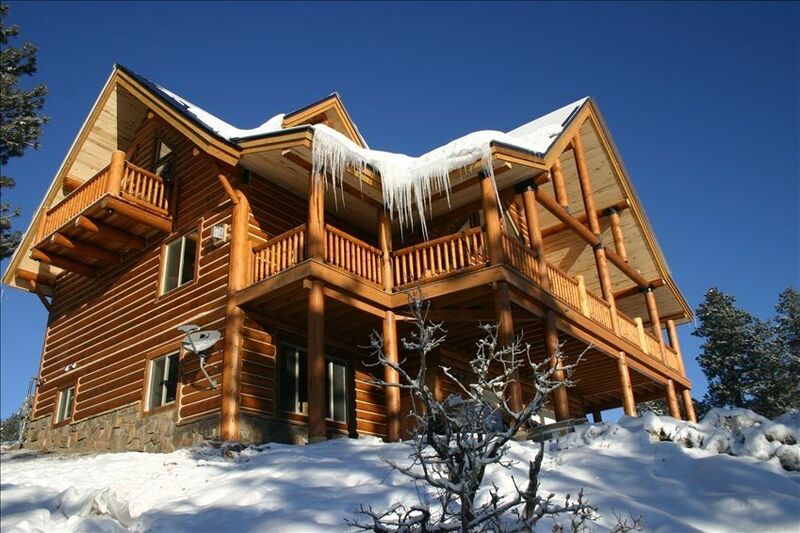 Home is 5 miles closer to Wolf Creek than Pagosa Springs - off highway #160. The home is visible on a ridge overlooking highway #160 at 48 Royal View Court - off Harman Ave. in San Juan River Village. Activities abound - winter and summer. There is no ski in-out housing at Wolf Creek but rates are much more reasonable than many other ski resorts and the skiing and lifts are comparable. Summer hiking and activities in the cool summer air (white water rafting - tubing - fishing etc.) are as good as you will find anywhere in the "Rockies". Our home has proved to be very popular. The large theater (seats 12 in leather recliners) has been loved by young and old. Please advise whether you want 4 or 6 bedrooms (extra $50/nt) for unlocking +$25 extra cleaning fee. The rates quoted can be discounted for 6 days or more bookings ($100 - $200), and if you only want the 4 bedrooms, I can refund $50/nt. from your fee.